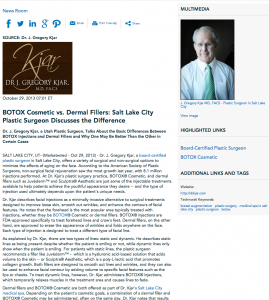 Dr. J. Gregory Kjar, a Utah plastic surgeon, talks about the basic differences between BOTOX injections and dermal fillers and why one may be better than the other in certain cases. Salt Lake City, UT – Dr. J. Gregory Kjar, a board-certified plastic surgeon in Salt Lake City, offers a variety of surgical and non-surgical options to minimize the effects of aging on the face. According to the American Society of Plastic Surgeons, non-surgical facial rejuvenation saw the most growth last year, with 8.1 million injections performed. At Dr. Kjar’s plastic surgery practice, BOTOX® Cosmetic, and dermal fillers such as Juvéderm™ and Sculptra® Aesthetic are just some of the injectable treatments available to help patients achieve the youthful appearance they desire – and the type of injection used ultimately depends upon the patient’s unique needs. Dr. Kjar describes facial injections as a minimally-invasive alternative to surgical treatments designed to improve loose skin, smooth out wrinkles, and enhance the contours of facial features. He notes that the forehead is the most popular area typically treated with injections, whether they be BOTOX® Cosmetic or dermal fillers. BOTOX® injections are FDA-approved specifically to treat forehead lines and crow’s feet. Dermal fillers, on the other hand, are approved to erase the appearance of wrinkles and folds anywhere on the face. Each type of injection is designed to treat a different type of facial line. As explained by Dr. Kjar, there are two types of lines: static and dynamic. He describes static lines as being present despite whether the patient is smiling or not, while dynamic lines only show when the patient is smiling. For patients with static lines, the plastic surgeon recommends a filler like Juvéderm™ – which is a hyaluronic acid-based solution that adds volume to the skin – or Sculptra® Aesthetic, which is a poly-L-lactic acid that promotes collagen growth. Both fillers are designed to smooth out lines and wrinkles, and they can also be used to enhance facial contour by adding volume to specific facial features such as the lips or cheeks. To treat dynamic lines, however, Dr. Kjar administers BOTOX® injections, which temporarily relaxes muscles in the treatment area and causes lines to fade. Dermal fillers and BOTOX® Cosmetic are both offered as part of Dr. Kjar’s Salt Lake City medical spa. Depending on the patient’s cosmetic goals, a combination of a dermal filler and BOTOX® Cosmetic may be administered, often on the same day. Dr. Kjar notes that results of each injectable differs, and it is normal to experience mild bruising with the treatments. He explains that results of BOTOX® Cosmetic will take seven to ten days to appear, and Sculptra® Aesthetic gradually erase lines over the course of three to four months. Juvéderm™ results, however, typically seen immediately following the treatment. Facial injections prove to be a popular method of treating lines and wrinkles at Dr. Kjar’s plastic surgery practice. To reduce the minimal discomfort associated with the procedures, he often uses lidocaine to numb the area before Juvéderm® or Sculptra® Aesthetic, and ice before BOTOX® injections. These treatments usually take about 30 minutes or less to perform, depending on the number and size of the targeted areas. The length of results can be anywhere from three months to a year or more, depending on the specific injectable utilized. Plus, Dr. Kjar says most patients can have occasional “touch-up” treatments once the effects of the injectable begin to fade. Ultimately, Dr. Kjar advises anyone considering facial injections to do their research to find a qualified doctor who emphasizes safety and goals of natural-looking results. Dr. J. Gregory Kjar is board certified by the American Board of Plastic Surgery and earned his medical degree from the University of Utah. In addition to training at Southeast Michigan’s Providence, Mt. Carmel, and Sinai Hospitals, Dr. Kjar completed a fellowship in craniofacial and plastic surgery at the Mayo Clinic in Minnesota. He offers a variety of procedures at his practice, including breast augmentation, tummy tuck, facelift, non-surgical options, and other treatments. Dr. Kjar holds hospital privileges at LDS Hospital, Lakeview Hospital, Davis Medical Center, and Mountain West Medical Center. He is available for interview upon request.